If you're still teetering about purchasing a Surface, perhaps nearly swayed by recent price reductions, you're in luck: You've got until further notice to hem and haw. According to ZDNet, discounted prices that went into effect in early August are here for good, at least in the U.S., with the Surface Pro, Touch Cover and Surface RT all seeing some slices. What's more, there appear to be price cuts going into effect globally, with the Microsoft UK and Australia websites showing discounted pricing for Surface and accessories. Whether any global price reductions are permanent or temporary isn't yet clear, but let's look at the numbers, shall we? In the U.S., the $100 Surface Pro price drop will stay in effect, meaning a 64GB Windows 8 machine starts at $799. Touch Covers are now $40 off, giving them a new starting point of $79, and a Limited Edition Touch Cover will cost $89. As for the black sheep of the Microsoft tablet family, a Surface RT and cover bundle will skim off $50, allowing buyers to take less of hit when purchasing the pair at $399. The response to the Surface promotions, which were only slated to last through Aug. 29, "has been exciting to see," a Microsoft spokesperson told ZDNet's Mary Jo Foley, and it seems the company is spreading the discount love internationally. 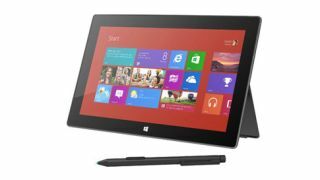 According to Engadget, several European countries are seeing the original Surface Pro plummet €100. The Microsoft UK website shows a 64GB Surface Pro for £639, down from £719, and a formerly £799 128GB version now at £719. The Touch Cover has a slashed through price of £99.99 and a new price of £64.99, a discount of £35. The Surface RT is already selling at a reduced price in the U.K. of £279, down from £399. In Australia, the Microsoft site lists the Pro for AU$899, and it's noted the tablet is "now $100 off" from its launch price of AU$999. We're working to get comment from Microsoft on the global pricing changes and will update this story when we have information to share.